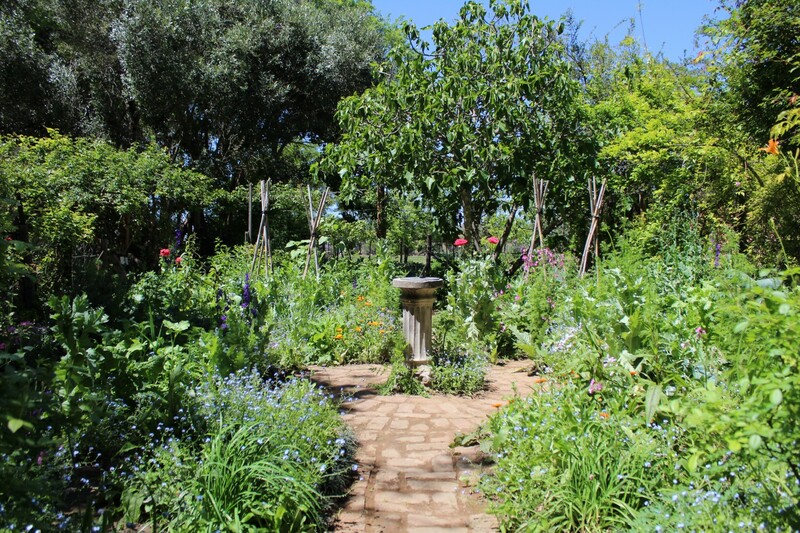 Situated an easy 10km from town, Albertvale farm garden is a sprawling green woodland haven for edible, aromatic and medicinal plants and earth-friendly gardening practice. This year a number of artists are exhibiting here - Bob MacKenzie, Shirley Pittaway, Karen Flood, Bianca Whitehead, Cathy Light (both ceramicists). Plus Debbie Johnson’s lovely Rosy Regards cards and panels. Kim will offer sunrise yoga sessions, two cook’s garden masterclasses and guided walkabouts of the gardens. Please see back page programme for all details of times, costs and booking. Freshly grilled wagyu and halloumi burgers will be served from 12h00 - 15h00 on Fri, Sat, Sun. 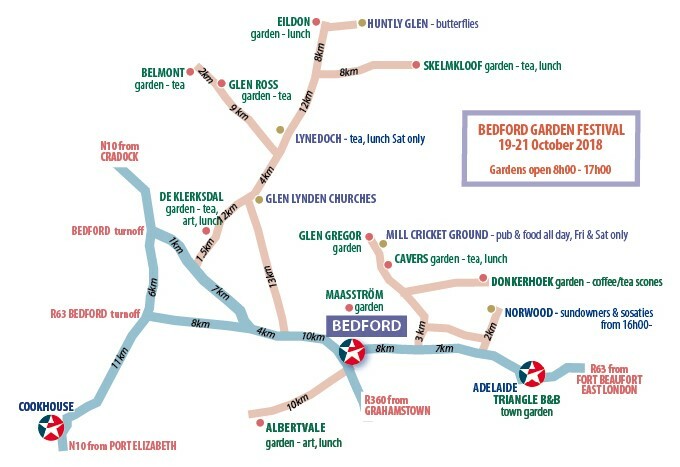 On the edge of town (R63 to Adelaide) you’ll find the rapidly maturing Upcycled Garden in the grounds of Eagle Hout Padstal. There’s a l-o-n-g rose walk, poultry yard, olives, figs, citrus trees, strawberries, macadamias and an abundance of salads and herbs. 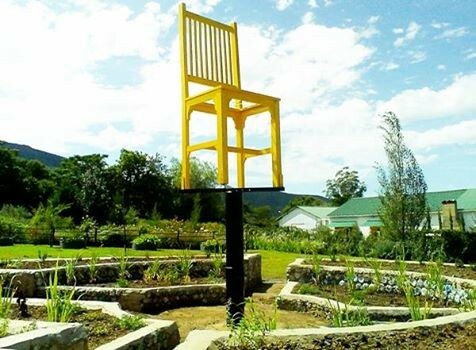 Donkerhoek (in the Cowie Valley) is another mustn’t-miss for all interested in growing food gracefully. It’s almost self-sufficient: a chicken tractor and cow-byre provide compost boosters as well as milk and protein for staff and homestead. All benefit from the large veg beds where plants are allowed to go past maturity so seed can be collected for the next season. Back in town, visit the Township Garden Route where all participants are encouraged to grow vegetables as well as flowers - roses are the favourites. 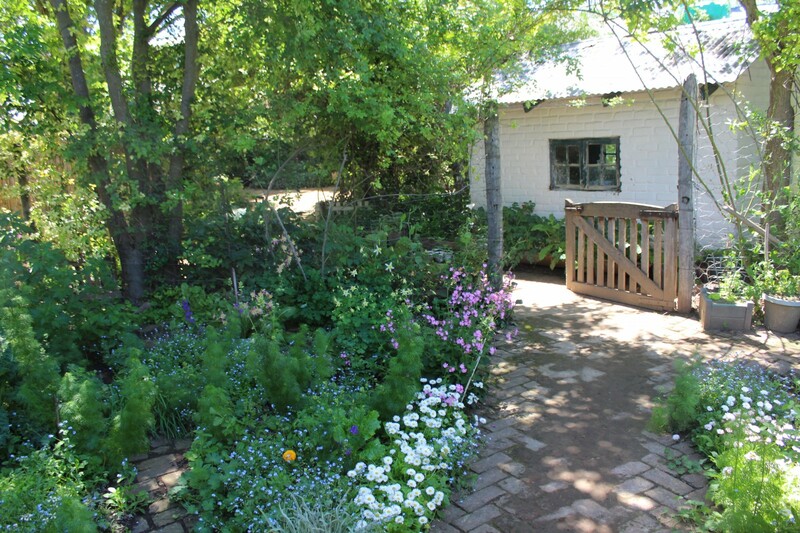 Situated an easy 10km from town, Albertvale farm garden is a sprawling green woodland haven for edible, aromatic and medicinal plants and earth-friendly gardening practice. This year a number of artists are exhibiting here - Bob MacKenzie, Shirley Pittaway, Karen Flood, Bianca Whitehead, Cathy Light (both ceramicists). Plus Debbie Johnson’s lovely Rosy Regards cards and panels. Kim will offer sunrise yoga sessions, two cook’s garden masterclasses and guided walkabouts of the gardens. Please see back page programme for all details of times, costs and booking. Freshly grilled wagyu and halloumi burgers will be served from 12h00 - 15h00 on Fri, Sat, Sun. THE UPCYCLED GARDEN Lana and Ben Blom 046 685 0994 Enter via Eagle Hout Entry R5 Licensed restaurant, nursery, bank card facility.